Some of the best reporting on conditions in San Francisco appears in the neighborhood newspapers. This article, reprinted here in its entirety, was first published in the November 2001 issues of the Richmond ReView and the Sunset Beacon. One year ago, a young mother was stabbed to death in her Richmond district apartment by a former boyfriend in front of her two children. Now her mother asks for one thing — justice. “I want the police to catch him. I want justice for my daughter,” Clara Tempongko, the mother of the victim, told approximately 20 family members and supporters who gathered Oct. 22 for a vigil in front of her daughter’s 22nd Avenue apartment. 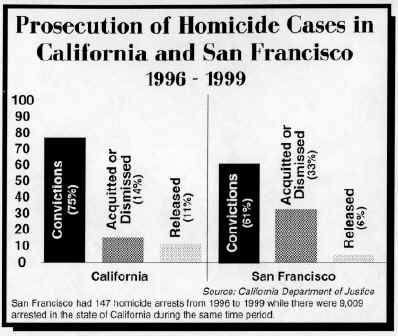 But justice is something that occurs in only 25 percent of homicide cases in San Francisco. 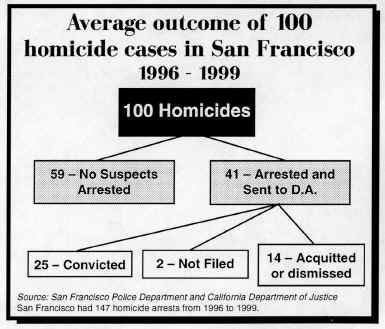 According to statistics obtained from the homicide unit of the SF Police Department and the California department of justice, police make arrests in 41 percent of homicide cases and the District Attorney convicts 61 percent of those arrested. San Francisco’s arrest rate lags behind the neighboring cities of Oakland (46 percent) and San Jose (75 percent), cities with similar populations (58 percent) and falls 17 percent below the national average (67 percent). The Richmond District mirrors the citywide arrest rate, with seven homicides committed between 1996 and 2000 that resulted in two arrests and one warrant being issued for a suspect. A closer look at the criminal justice system reveals that many factors contribute to the dismal picture: An over-worked homicide unit, the reluctance of witnesses to come forward in gang-related homicides, an under-staffed crime laboratory that is months behind producing critical reports, a Crime Scene Investigations team so under-staffed that it could compromise evidence, a District Attorney’s Office that only prosecutes “rock-solid cases,” according to some officials, and a slow, out-dated computer system. San Francisco Mayor Willie Brown recently cited the Tempongko murder as an example of why the criminal justice system needs a new computer system. The new system is designed so critical information can be shared easily between the police, sheriff, District Attorney, courts, and state and federal agencies. Ironically, one month before her death on Oct. 22, 2000, Clair Joyce Tempongko, 28, called police twice to her apartment to report that her ex-boyfriend, Tari Ramirez, had choked and threatened her. Copies of the police reports never made it to the district attorney’s office and the Adult Probation Department. When Ramirez went before a judge for an unrelated incident last September, he could have been sentenced to jail for a parole violation if the judge had been made aware of the recent incidents. Instead, Ramirez was sentenced to 30 days in a work alternative program and then he went after Tempongko. Police now believe Ramirez has fled to Mexico. Experts familiar with San Francisco’s criminal justice system expressed surprise at the low arrest, or “solve” rate. “The low solve rate on homicides shocks me,” said Linda Klee, the criminal trial chief attorney for SF District Attorney Terence Hallinan. Peter Keane, dean of the Golden Gate University Law School and chief assistant San Francisco public defender from 1979 to 1998, concurred. When asked to comment on the low arrest rate, Mayor Brown, through his press secretary, referred all questions to Police Chief Fred Lau. Lau declined our request for an interview and referred all questions to his public relations spokesperson, Dewayne Tully. Tully blamed the low arrest rate, in part, on the lack of cooperation by witnesses in gang and drug-related shootings. “Since a disproportionately high number of gang and drug-related shootings have recently contributed to the number of homicides and because witnesses in such killings are historically reluctant to come forward, many of these killings remain unsolved,” Tully said. Tully also said the statistics do not account for homicides that are eventually solved. “All I can tell you is that homicide solving goes beyond investigators following a step-by-step procedure that, at the end of a set period of time, yields a suspect,” he said. 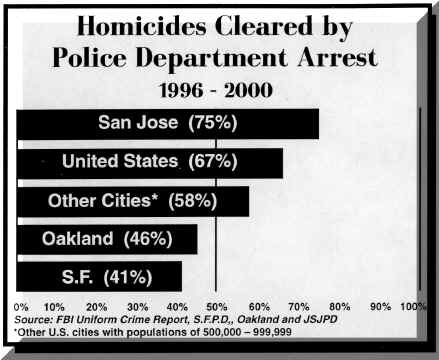 But Tully’s remarks fail to explain why the city of Oakland, which is known for its historically high number of gang and drug-related shootings, does a better job of solving its homicide cases. While Oakland’s homicide unit recently had the same number of investigators and a much higher number of homicides that San Francisco, its arrest rate is higher — 46 percent versus 41 percent. At the other end of the spectrum is San Jose. This Bay Area city, which also has a high number of gang and drug-related homicides, has about one-half the homicides and until recently three more investigators that San Francisco. It also has a 75 percent arrest rate. The department is banking on the goodwill and trust Hendrix has built up over the years with the African-American community and new DNA-identification technology recently acquired by the city’s crime laboratory to solve gang-related homicides that now languish in file drawers. But just how many unsolved homicide cases there are in those file drawers remains a mystery. Even Capt. Roy Sullivan, who heads up the police department’s homicide unit, did not know. “I really couldn’t say. I don’t have an exact number. Homicides cases from years back remain open until they are solved,” Sullivan said. Sullivan did say that several new investigators were recently added to the homicide unit, bringing the staff up to 13. The unit is still down one from its traditional number of 14. Sullivan said the heavy workload was a major cause for getting the additional officers. “Our unit was fatigued because of the caseload. We were concerned about burnout,” he said. Sullivan also stressed that when gang members are involved in homicides, members of the gang often help hide the suspect from the police or give them money to leave town. He said it is not unusual for gang members to flee to another large city where they can blend into the population and escape detection. Police believe this may have happened two years ago when an argument over a game of pool at a local watering hole in the Outer Sunset District led to the murder of an innocent bystander, Robert Sadler. Sadler’s murder, one of 58 in the city in 1999, shocked neighbors in this quiet bedroom community which saw its homicide rate climb to a five-year high. Sadler’s murder was one of the most chilling and cold-blooded in recent memory. In 1999, the year of his murder, the number of homicides in the Taraval police district spiraled to an unprecedented nine, up from five in 1998 and three in 1997. Although the identities of Sadler’s killers were known to police at the time of his murder, no arrests have been made and the odds are that his killers will never serve a day in jail for their crime. According to sources familiar with the case, several young Asian males, identified as members of the Jackson Street Boys, a violent street gang, were thrown out of the club earlier in the evening for fighting and vowed to return for revenge. Although Sadler’s only involvement was to break up the altercation and calm tempers down, he ended up paying with his life. According to witnesses, the young men returned to the bar about 1 a.m. in a car and fired a weapon through a window. One man was wounded and Sadler was hit in the chest. He died in the arms of his fiancée before help could arrive. As families of victims cry out for justice, what they often find instead is an understaffed, underfunded, politically driven criminal justice system that is working hard but failing to deliver closure to grieving families. In addition to a backlog of unsolved cases and a short-staffed homicide unit, the Crime Scene Investigations (CSI) team, a critical component in the criminal justice system, is short six investigators. When a homicide occurs, a central dispatcher calls a homicide team, the coroner, an ambulance, and a member of the Crime Scene Investigations team. If witnesses are not available, the coroner’s report, which determines the cause and time of death, is often crucial to solving a case. The CSI investigator is called to the crime scene to collect the physical evidence that is routinely used by homicide officers to identify suspects. Eventually, the district attorney uses the evidence collected at the crime scene to build a convincing case in court. Members of this team are seasoned veterans and many have years of special training. It takes about 10 years before an officer has the rank and seasoning to apply for a position on the team. In addition to collecting physical evidence, investigators also take photographs, make a diagram of the crime scene and process any finger and palm prints. This summer the CSI team received a new $2.5 million computer system, the Palmprint AFIS, that it hopes will make a serious dent in solving all crimes, including homicides. The new technology allows an investigator to scan palm prints into a system that searches for matches in national and state data bases. Called “cold hits” by police, the instantaneous matches provide police officers with immediate suspects. Since palm prints represent about 30 percent of all prints found at crime scenes, Jim Norris, the director of the Forensic Services Division, believes the new technology will prove to be a good weapon for solving homicides. But Norris says a biggest threat to solving homicides is the recent retirement of seasoned investigators. The CSI team, which normally has 20 investigators, is down about 30 percent. Not only has the shortage led to a morale problem within the unit, but Norris is concerned about compromising evidence. Norris explained that if two homicides occurred at the same time, the team is so understaffed it could not effectively respond. “If we had two serious homicide cases back-to-back we would have a problem. It will compromise the evidence. There is absolutely no question about it,” he said. Once the CSI team collects and secures physical evidence at a crime scene, it is analyzed by criminalists in a new state-of-the-art crime laboratory at the former Hunters Point Naval Shipyard. Prior to 1999, the lab operated out of a dingy, ill-equipped room at the Hall of justice. When the state refused to accredit the lab because of its inadequacies, DNA evidence had to be shipped out to external laboratories for analysis. After accreditation failed, city representatives acquired land from the Redevelopment Agency and converted a building that was used as a postal facility during the Gulf War into a new laboratory. The prior facility was not adequate to ensure that we would not contaminate evidence,” explained Martha Blake, a senior criminalist who oversees the laboratory. The new lab is equipped with the latest technology and is in the process of getting its accreditation from the state. About one-half of the police crime laboratories in the country are currently accredited. At the present time, the lab is operating with 17 civil service criminalists, 4 of which hold the title of senior criminalist. Two police officers are also assigned to the crime lab. But the crime laboratory, like the CSI team, is understaffed. The situation is particularly critical with DNA and Blake says she could easily use double the staff to process DNA evidence. Even though DNA evidence is critical in homicide cases, according to Blake homicide officers routinely wait two to three months for DNA to be processed. Blake says she runs into homicide officers at the Hall of Justice all the time who ask when their DNA reports will be ready. “That’s the biggest gripe I get around there,” she said. Terry Coddington, a criminalist at the crime laboratory who specializes in firearms, says his unit also needs about twice the staff. Last June, the firearms division of the crime laboratory acquired a new system that allows it to image cartridge cases, enter the information into a national data base, and make “cold hits” or matches. While Coddington is enthusiastic about the new technology, he explained that his unit lacks the manpower to input data. “Just in terms of building up a data base — that’s what we are way behind on. We could probably use twice the staff just to get the data into the system,” Coddington said. In order to attract a quality staff and keep the professional staff it now has, Blake wants more funds for training and for memberships in professional organizations. “Our entire budget for professional training for the year is $5,000. The city of Oakland pays for membership in two professional organizations for its personnel — we don’t pay for one,” Blake said. Blake leveled harsh criticism at the district attorney for failing to prosecute cases, including homicides, where strong physical evidence has been documented. “It’s frustrating. We work hard to put together good evidence and they often times don’t take risks. The DA’s office only wants to take cases they can win,” she said. District Attorney Terence Hallinan, who has come under fire from the mayor in the past for being lax on prosecuting violent crimes, declined to be interviewed. But Hallinan’s chief trial attorney, Linda Klee, says many factors make homicide cases more difficult to prosecute. According to Klee, a lack of witnesses in gang-related cases, understaffing, grants that tie the agencies’ hands, the fact that homicides cases take two to three years to prosecute, and liberal juries all contribute to the problem. According to Klee, short-staffing forces cases to bounce back and forth between attorneys rather than on a district attorney handling most of the case from beginning to end. “We need to do more cases vertically. We don’t’ have the resources,” Klee said. Because homicide cases routinely take years to prosecute and the DA’s office claims to be short-staffed, Klee says that five deputy attorneys are assigned to homicide cases. “When motions start rolling in, it can take two to three years to trial,” Klee said. At Mayor Willie Brown’s Crime Summit in March, figures were released that show a 27 percent increase in the police department’s budget from fiscal 1995-96 through 2000-01. During the same time period, the district attorney’s office received a 57.3 percent increase in its budget. Part of an increase in this year’s budget will be allocated to a new $4 million computer system to replace the aging technology now used by the criminal justice community. The old Case Management System (7), which was considered revolutionary in 1975, is so outdated that many criminal justice agencies are developing their own internal systems, an act that threatens the historically integrated model. The new system, called JUSTIS, would instantaneously link vital components of the city’s criminal justice system, as well as access information from state and federal systems, on one screen. However, several departments, including the police and sheriff, have declined to participate in the project. “Both the sheriff and police are embroiled in bringing up their own system,” said Dwight Hunter, the project director for the JUSTIS system. Hunter explained that convincing San Francisco police officers to convert to the new system was a hard sell. He said he believes that broken promises in the past are one reason why the department decided to work on its own system. Hunter also said part of the problem is normal resistance to change. “I tried. We went to the police and asked them how we could design a system that works for them,” he said. According to Hunter, the new system has major advantages over the old network for everyone. He explained that the new system would allow police officers to instantaneously access on one screen the entire criminal history of a suspect, including state and federal information in seconds, complete with graphics. The current system does not have direct links to the information and has to be accessed by going in and out of different data banks. The new system would have all information contained within a single communications system. “What they are using now — it would make you weep,” Hunter said. A major hurdle the project still faces is funding. Hunter says that to hook up everyone that wants the new system would cost the city more than $5 million this fiscal year. While the city made a verbal promise of $4 million, Hunter was told that $750,000 of that amount will not be available. Hunter says the District Attorney’s Office, the Adult Probation Department, and the Public Defender’s Office are expected to fully convert to the new system this year.